We sell all new Procon pump models. We can refurbish all the models of Stainless Steel salt water pumps, and desalination systems pumps assembled with Procon pumps. We also have been supplying the industry with brass Procon pumps for portable water and soft light liquids, such as glycol, light oils and chemicals spray systems. Circulation and temperature control with the highest quality 316 stainless steel casting and rotor. Procon's salt water pumps are manufactured to resist the high corrosion levels of sea water. Procon pumps are capable of pumping 265 gallons per hour and up to 250 PSI. All the internal parts are made of graphite. Procon pumps offers 4 different type of seals, Nitrile, Viton (Fluorocarbon), Ethylene Propylene and Neoprene. The salt water industry has used Procon pumps in the past with great success. Since 1945, the unique Procon performance and the high reliability of all its pumps makes Procon one of the best positive displacement pump on the planet. 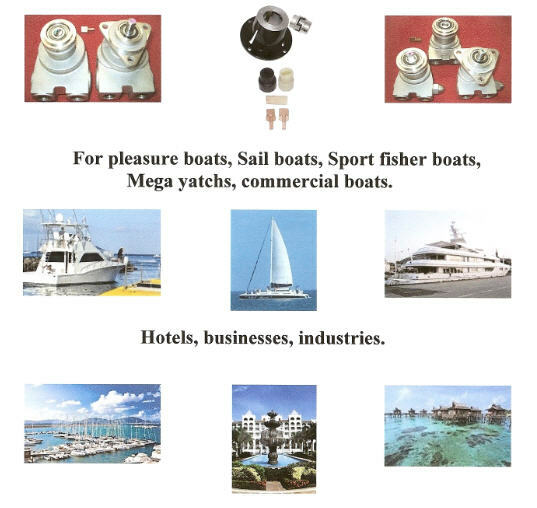 Procon pumps are used by sail boats, catamarans, pleasure boats, power boats, large yachts and commercial ships. We can ship direct to your boat the same day you order, at any marina in the world that has access to major transport companies such as DHL, UPS or FEDEX. You can also use your own transport service if you have one. We accept Visa, Master Card, American Express and bank transfers. E-Mail us, you will see, it's easy and fast! At Parts M.L. we know you don't have any time to lose. You want it fast, you're at the right place. We can also rebuild your defective pump the same day we receive it, since we have all the parts in stock. Professional website design by MWD.